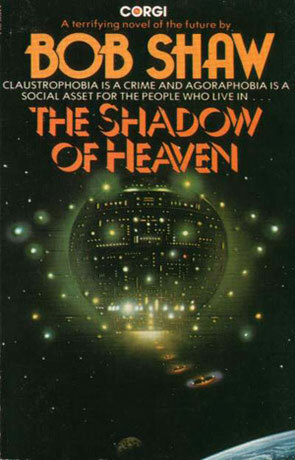 The Shadow of Heaven is a science fiction novel by Bob Shaw. First copyrighted 1969, this "terrifying novel of the future" is surprisingly unjaded by time. In The Shadow of Heaven, World War III isn't the nuclear inferno as must feared at the time, but something a lot closer to what we fear today. A rouge state unleashes a virus that makes it impossible to grow crops. This leads to food shortages, which leads to "The Compression", where people are moved to the large costal towns (the only real source of food is the sea). It doesn't really say what happens in the rest of the world, but US of A is divided onto two mega-cities (east and west coast), where people live like sardines (as it says on the back of the book). The only source of normal vegetables is the anti-gravity islands, which floats high above the coasts (this somehow makes them impervious from the virus). To keep envy in check these sky-farms are totally automated and inaccessible to all humans. Enter Victor Sterling. Journalist. Victor has lived in a mega-city all his life and he doesn't even notice the multitudes surrounding him. Born and breed city-dude. That is, until his search for his brother, who has gone missing, leads him to the sky-farm called "heaven". Written on 1st November 2000 by TC.